This product is a 2 page reading which includes pictures, about the Japanese interned during WWII after the bombing of Pearl Harbor. There are also higher order thinking questions at the end. 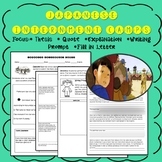 This activity was designed to address ELA Common Core Learning Standards in an 8th Grade Social Studies lesson. The primary source excerpts come from http://sheg.stanford.edu/, but the text-based questions were created by me and are modeled after typical NYS 7th-8th Grade ELA Assessment questions. 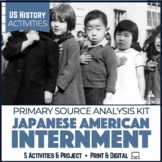 Japanese Internment Camps: Good or Bad?